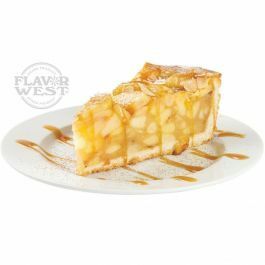 Enjoy the sweet and tart apple flavor of Dutch apple pie flavoring. It is bursting with tangy apple taste that gets you smiling more than usual. Type: Dutch Apple Pie water soluble flavoring. Ingredients: Natural and Artificial Flavoring, Propylene Glycol, Ethanol and Water. USP Kosher Grade Flavoring. Usage Rate:15-20% for E-use. Flavor Suitability: Drinks, beverages, ice cream, sandwich, candies, baking treats and more. Specific Gravity: 1.05 No Refunds on Flavoring. Tastes like Dutch apple pie to me. Great for all day vape. I mixed 20% with settings of 3.8v and a 1.6 coil. I use a naultilus tank and 1.6 ohm coil, 3.8 volt setting on my battery and this is one great flavored vape. Good for all day. This flavor is spot on. I used 14% with 4% whipped cream. Delicious. Just remember to let it steep to develop full flavor.